Gartner says, in 3 years, mobile application development projects will outnumber PC projects by 4-1 ratio and in 4 years, 50% of the people will primarily access their emails from a mobile device. So, the necessity of establishing a mobile channel for your customer is – well a no-brainer. However, should you just build a mobile website or should you also invest in building native application is not easy to decide. There can be no doubt that you need to have a website optimized for mobile devices. What is the best way to build and maintain that website is not a simple decision. There are many tools of different type available in the market but it is not strictly necessary to use any of them as each mobile platform comes with its own tool-set. Should you use any tool to create mobile website for smartphones? 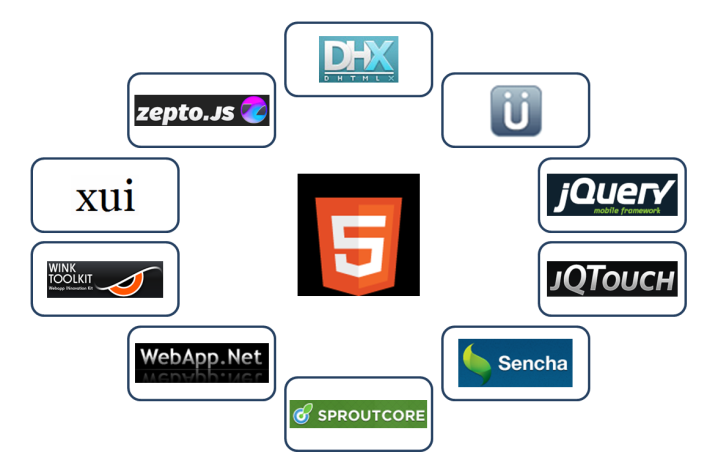 Why can’t you directly code in HTML5 – after all most mobile browsers now support HTML5. UI component and widget library to give you a head start with AJAX features. Style-sheet and skin to make the site look like a native application. Provide simplified mechanism for data manipulation, local storage and caching. Create an abstract layer for client-server interaction. Visual design and debugging tool. You can, off course, decide to write the framework yourself, but that will require effort. How to decide which tool is right for you? There are many tools available and there is no clear market leader. Each tool has its own strength and weakness – you need to match them with what is important for you and what you can live without. Do you want a toolkit which has already established itself as an RIA tool or are you looking for a tool which is optimized for mobile? Are you willing to consider an evolving product which looks promising? Do you want a lightweight tool or a tool with comprehensive features? Do you require full documentation? Are you planning to modify / extend the library? To you, how important is an active user base? Do you require only UI library or do you need a complete framework? Here are 10 tools – the ordering is alphabetic. Do let me know if there are any errors or omissions in the details I have provided. ← Gartner’s 11 IT Predictions for 2012 to 16 – What does it really mean? I need to develop a mobile website. Could you please guide what frame work should be used so that it can be accesible via smart phones and as well as symbian or java me hand sets.